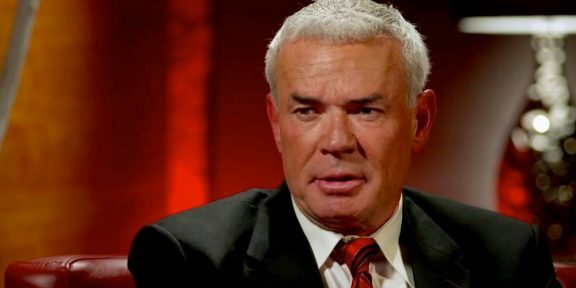 It seems that Eric Bischoff is having some fun on Twitter by teasing fans on the upcoming Smackdown General Manager role. The former WCW President has not appeared on WWE live television since December 2007 when he made a special appearance for Raw’s 15th Anniversary special. Last year he taped an episodes of Legends with JBL for the WWE Network, a two-hour special that is regarded one of the best interviews on the Network to date. A few weeks ago WWE also released an Eric Bischoff DVD which has some new interviews that Bischoff taped specifically for the release. Bischoff shocked the wrestling world in 2002 when he was revealed by Vince McMahon as the new General Manager of Monday Night Raw in a surreal segment where Vince hugged Eric on top of the stage, kicking off a WWE career that lasted three years.